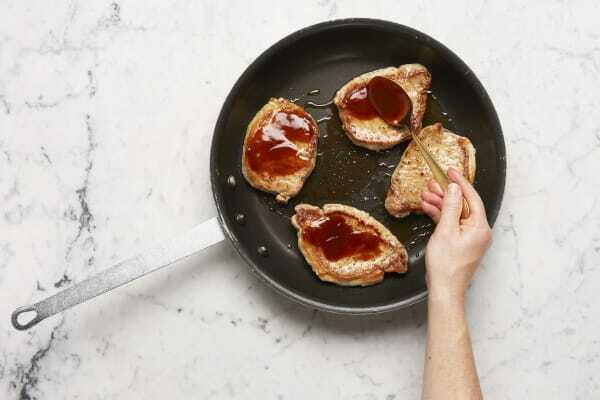 In this twist on your classic protein, starch, and veg, a hoisin-sriracha glaze adds a layer of sweet and spicy flavor to tender pork chops. 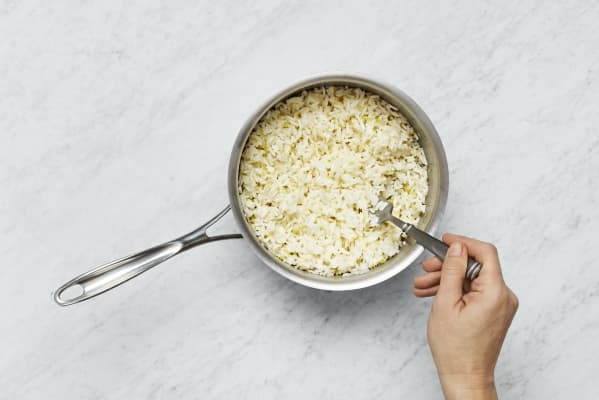 On the side, jasmine rice is steamed with sizzly ginger to give it an aromatic punch, and broccoli is simply roasted until the edges are browned and crispy and stems are tender. Adjust rack to upper position and preheat oven to 450 degrees. Wash and dry all produce. Peel ginger, then mince or grate until you have 1 TBSP. 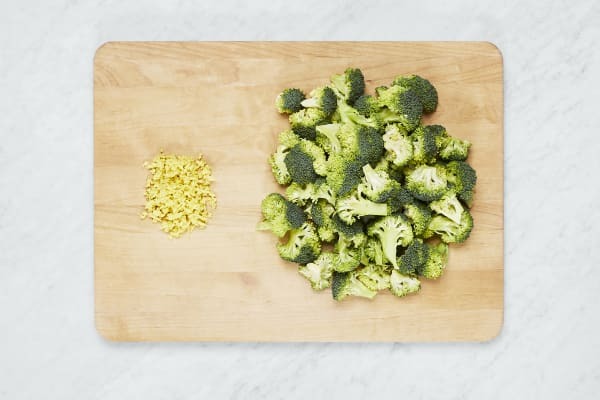 Cut broccoli into bite-sized pieces. Heat a large drizzle of oil in a medium, lidded pot over medium-high heat. Add ginger. Cook, tossing, until fragrant, 2-3 minutes. Add rice, 1¾ cups water, and a pinch of salt. Bring to a boil, then cover and reduce heat to low. Cook until tender, about 15 minutes. Keep covered until ready to serve. 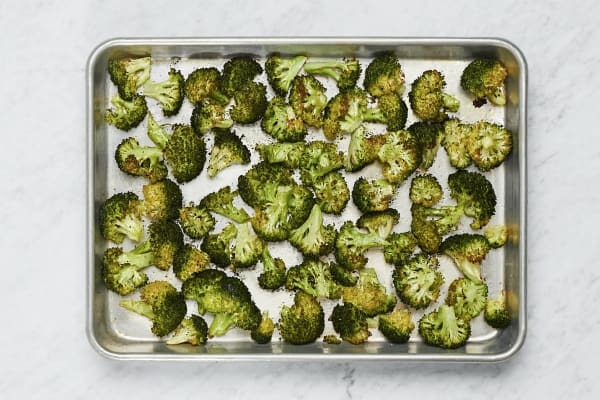 Meanwhile, toss broccoli on a baking sheet with a drizzle of oil and a pinch of salt and pepper. Roast, tossing halfway through, until browned and tender, about 20 minutes. 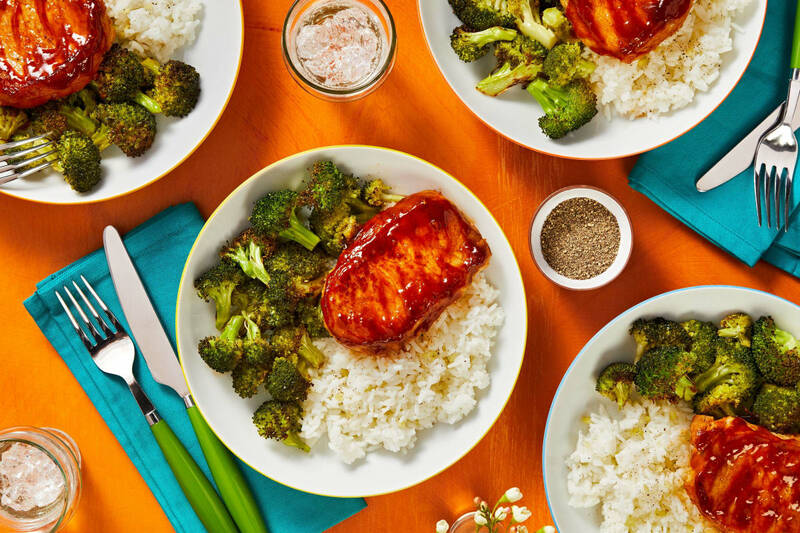 In a small bowl, combine hoisin, sriracha, ½ tsp sugar, and 3 TBSP water. Pat pork dry with paper towels; season all over with salt and pepper. Heat a drizzle of oil in a large pan over medium-high heat. Add pork and cook until browned and cooked through, 4-6 minutes per side. 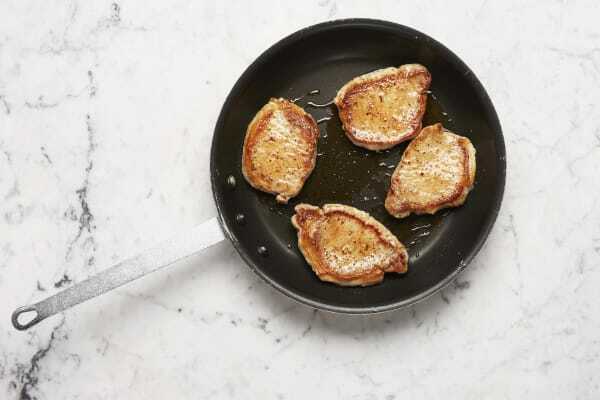 Add glaze to pan and bring to a gentle simmer. Cook, spooning glaze over pork, until coated, about 30 seconds. Season with salt and pepper. Turn off heat. 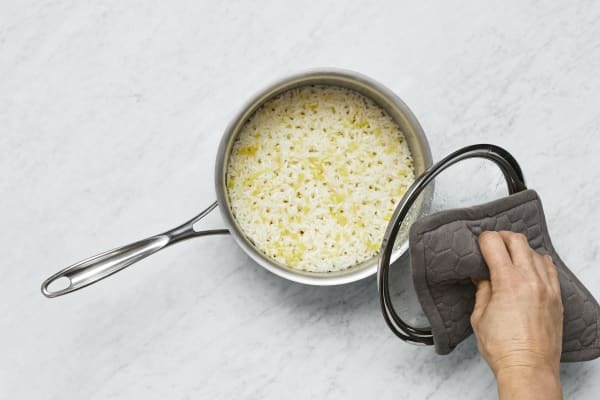 Fluff rice with a fork and stir in 1 TBSP butter; season with salt and pepper. Divide rice and broccoli between plates. Top rice with pork and any remaining glaze.